Despite its widespread distribution across much of North America, the common buttercup, Ranunculus acris, is not a native plant. Also called meadow buttercup or tall buttercup, this familiar species hails from Europe and Asia. It has a long blooming period and the buttercup generates an attractive, familiar yellow flower, but it is potentially toxic to grazing animals. Buttercups typically flower from spring through summer's end. The blooming period of the common buttercup starts in May and lasts through August. Common buttercup is a perennial plant, coming back and blooming year after year. The flower buds begin to develop during the prior year's late summer, notes the U. S. Department of Agriculture Natural Resources Conservation Service. A mild winter in the colder parts of the plant's range, in areas such as parts of Canada and the United States within USDA plant hardiness zones 3 and 4, enhances the development of these flowering buds. Most plants generate about four flowers, but this increases when the soil is extremely fertile or there is a lack of competition from other plants nearby. Common buttercups in cultivation tend to produce flowers their first year, while those that occur naturally sometimes do not flower for as long as 10 years. Some of the other buttercup species with large distributions in North America have somewhat different blooming periods from the common buttercup. The kidneyleaf buttercup, Ranunculus abortivus, blooms from April though August, beginning earlier and finishing flowering earlier as well. The swamp buttercup, Ranunculus septentrionalis, starts flowering in April and stops by July. The bulbous buttercup, Ranunculus bulbosus, blooms from April into June. Tall buttercup grows as high as three feet, with stems emerging from fibrous root systems. The stems are hairy and hollow, with the leaves at their base. Stems often form a branching network as they rise, with the five-petaled yellow flowers at their tops. 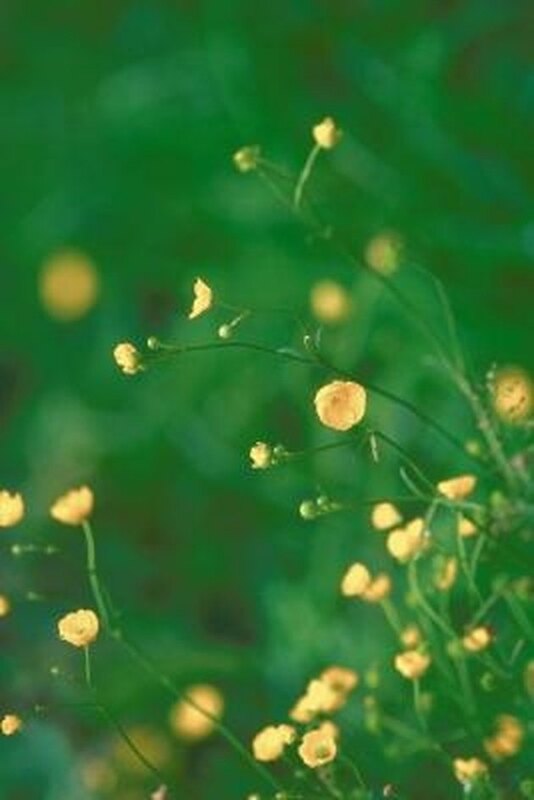 Buttercup flowers, as wide as one inch, possess a waxy appearance. This shiny veneer is the result of a specialized layer of cells under the surface of the petals, states the National Audubon Society Field Guide to Wildflowers. Few states lack the presence of this plant, which has a reputation as a noxious weed in some places. Texas, Oklahoma, Nebraska, Arkansas, Louisiana, Colorado and Arizona feature no common buttercups. The species grows in disturbed areas, along roadsides, in meadows and in old, abandoned fields. As a landscaping tool, they work best in naturalized areas, where you can view the bright yellow flowers in groups without worrying about their impact on your lawn. Common buttercup does best where the soil is acidic, spreading by seed to form large colonies. John Lindell has written articles for "The Greyhound Review" and various other online publications. A Connecticut native, his work specializes in sports, fishing and nature. Lindell worked in greyhound racing for 25 years. What Are the Different Types of Thistles? When Do Oak Trees Bloom?